X- Force is the most meaningful advance in strength training in the last 30 years. A patented "tilting" weight stack allows for a 40% heavier resistance on the "negative" (lowering) part of the exercise. This heavier negative resistance allows for a greater intensity of effort through a higher quality of resistance. Great strength gains in less time! Results that previously required several workouts a week can now be stimulated in 1-2 workouts a week. Research clearly supports the concept that negative (eccentric) training significantly improves muscular size and strength. And that even better results can be achieved by combining this with positive (concentric) training. Eccentric training is also known as ‘negative’ training simply because it is the opposite of traditional concentric training, which has always been labelled ‘positive’. In the positive training phase the weight is raised which means that the muscle shortens as it works. In the negative phase the opposite happens: the weight is resisted as it is lowered, which means that the muscle lengthens as it works. When we lower the weight we are approximately 40% stronger than when we raise it. The idea behind X-Force is simple. By tilting the weight stack 45 degrees on the positive motion, we’ve been able to supply a 40% heavier negative load. 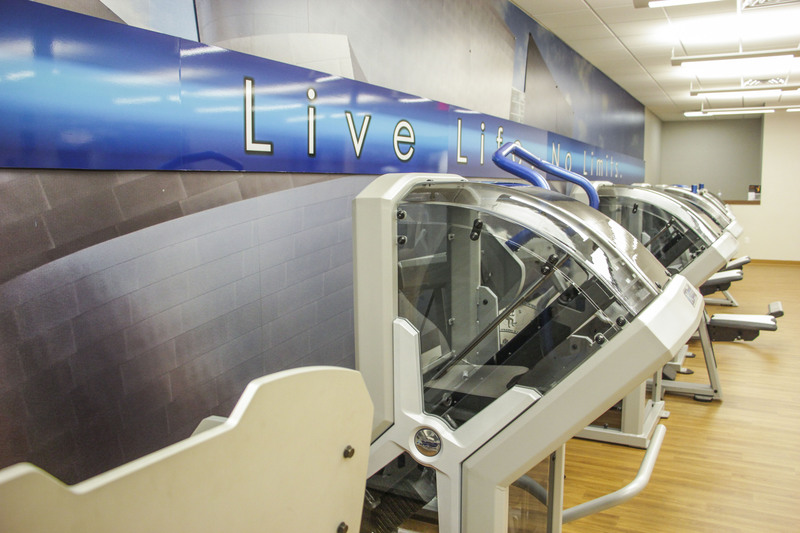 We have a line of X-Force machines on the main exercise floor and inside the X-Force Body Studio at GHF Main. You may choose from leg press, leg extension, leg curl, lat pull down, row, shoulder press, lateral raise, a variety of chest presses and arm cross, pullover, low back, abductor/adductor, and abdominal. Transform your body with the most effective and technologically advanced strength-training system available.